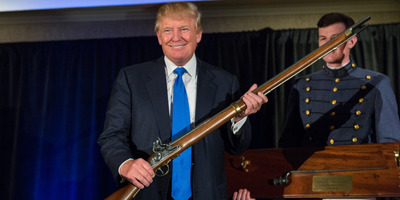 Richard Ellis/Getty ImagesDonald Trump with a replica flintlock rifle awarded to him by cadets during the Republican Society Patriot Dinner at the Citadel Military College in 2015 in Charleston, South Carolina. Democratic lawmakers scoffed at reports of President Donald Trump’s proposal to stage a military parade. Trump reportedly floated the idea to officials after witnessing France’s military parade in July during that country’s Bastille Day celebration. Trump’s inspiration for the parade came after he witnessed France’s armed forces march during Bastille Day in July, according to a Washington Post report. The president floated the idea during a meeting with US military officials including Defence Secretary Jim Mattis and Gen. Joe Dunford, the chairman of the Joint Chiefs of Staff. Trump’s musing was perceived as a direct order, sources said in The Post’s report. The plan is reportedly in its “brainstorming” stages and may be held this year around a patriotic holiday, like Independence Day on July 4 or Veterans Day on November 11. Democratic Sen. Tammy Duckworth of Illinois, a former lieutenant colonel in the Army, also weighed in and called Trump “Cadet Bone Spurs,” apparently a reference to an ailment Trump used as justification for a draft deferment during the Vietnam War. The CNN analyst Mark Hertling, a retired Army lieutenant general, said he had a “bemused smile” when he heard of the reports. “I had to smile, Anderson,” Hertling told Cooper. “It’s an interesting request from the president to his military.